A country-style kitchen has undeniable appeal. While country kitchens can range from traditional farmhouse to something more sophisticated, they all share certain fundamental design, color, and style characteristics. Here's how you can get the look of a country kitchen in your home. Natural materials and weathered surfaces give newer country kitchens lived-in character. Beaded-board paneling is a common sight in most schemes, sometimes used as wainscoting below painted walls or around the outside of a work island. Here you’ll find it on the ceiling and on the back inside wall of the cabinets. Warm wood tones are also a necessity in a country kitchen, whether a solid plank floor underfoot or an unexpected variation like this one, where wood planks frame floor tiles. Tiles used for backsplashes in country kitchens are often white. As a fun twist in this kitchen, white tiles are set on a diagonal and accented with smaller green squares. 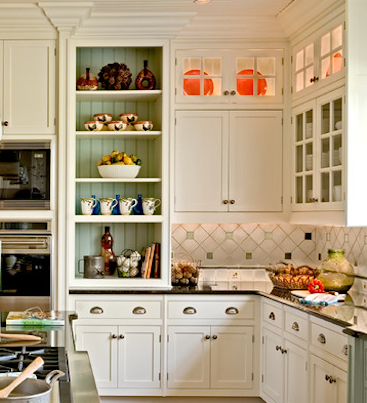 The appeal of glass-front cabinets in country kitchens is twofold: They not only trigger nostalgic images of farmhouse kitchens, they also allow homeowners to showcase favorite china patterns or collections. Color-coordinated dinnerware looks especially pleasing behind glass. 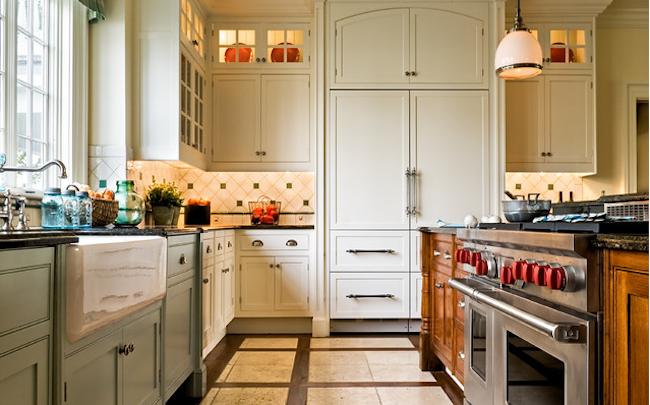 If you prefer solid doors, or if your budget does not allow you to replace the cabinets you have now, consider whitewashing existing cabinets for a fresh country look. Replacing old, indistinct hardware with vintage designs (like this kitchen’s half-moon drawer pulls) is an easy and inexpensive way to give existing cabinetry a country update. 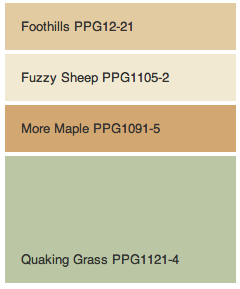 Country-style looks for knobs include glass and porcelain designs as well. Many manufacturers today make hardware with a nostalgic look, but you might also consider contacting a source for architectural salvage in your area for more options and a fun treasure hunt. Although this decor harks back to simpler times, today’s country kitchens have all the amenities we’ve come to rely on. That being said, the placement of modern appliances within a country-style setting is usually less conspicuous than in a contemporary interior where state-of-the-art gadgets might be the focal point of the room. Take this kitchen’s four-foot-wide Sub Zero refrigerator, for instance. Wood paneling on the exterior allows it to blend into the cabinetry around it. An apron-front sink is a classic element in country kitchens, and fortunately, the style has made a comeback in recent years. With many offerings from a number of manufacturers, these attractive fixtures are now much easier to find. 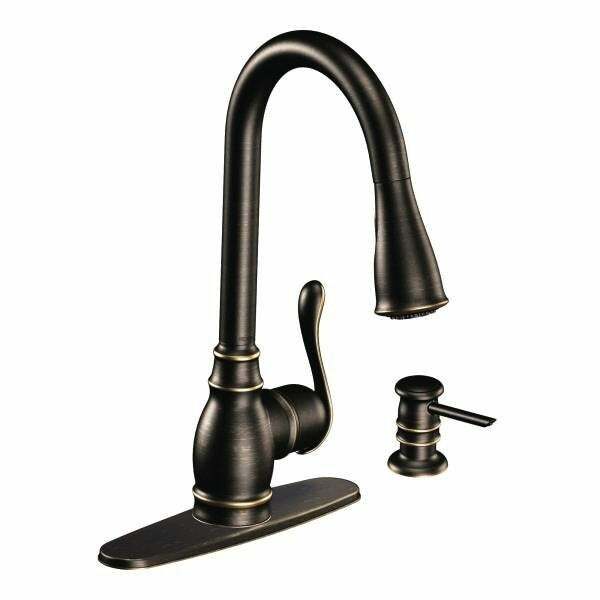 If you prefer a sink that’s set into the countertop, however, consider an old-fashioned swan-neck faucet to complement the overall style of the room. Bright, sunny mornings are one of the best times to enjoy a country kitchen. Large windows left bare or adorned with the simplest of curtains are optimal in such settings. For overhead lighting, pendant lights with glass shades are a popular option. Additional recessed lighting amplifies a room’s brightness while letting the other design elements in the room command full attention. Once the country background is in place, accessories and collections allow you to personalize the space and add those perfect finishing touches. Baskets, blue canning jars, and vintage ceramics such as yellowware mixing bowls or ironstone pitchers are all classic choices. Be wary of over-accessorizing, though. Confine larger collections to a single cabinet or hutch to keep the room’s overall look uncluttered.